Author: Weiner, Jennifer Set In . . . Description: Meet Rose Feller. She's thirty years old and a high-powered attorney with a secret passion for romance novels. She has an exercise regime she's going to start next week, and she dreams of a man who will slide off her glasses, gaze into her eyes, and tell her that she's beautiful. She also dreams of getting her fantastically screwed-up little sister to get her life together. Meet Rose's sister, Maggie. Twenty-eight years old, drop-dead gorgeous and only occasionally employed, Maggie sings backup in a band called Whiskered Biscuit. Although her dreams of big-screen stardom haven't progressed past her left hip's appearance in a Will Smith video, Maggie dreams of fame and fortune -- and of getting her dowdy big sister to stick to a skin-care regime. These two women with nothing in common but a childhood tragedy, shared DNA, and the same size feet, are about to learn that their family is more different than they ever imagined, and that they're more alike than they'd ever believe. 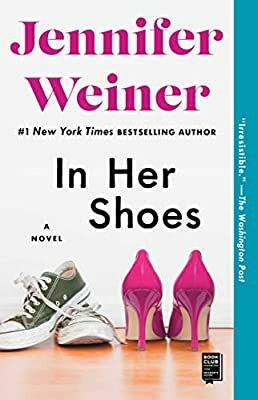 In Her Shoes -- Jennifer Weiner's follow-up to her critically acclaimed debut, Good in Bed -- observes Rose and Maggie, the brain and the beauty, as they make journeys of discovery that take them from the streets of Philadelphia to Ivy League libraries to a "retirement community for active seniors" in Boca Raton. Along the way, they'll encounter a wild cast of characters -- from a stepmother who's into recreational Botox to a small, disdainful pug with no name. They'll borrow shoes and clothes and boyfriends, and make peace with their most intimate enemies -- each other. Funny and poignant, richly detailed and wrenchingly real, In Her Shoes will speak to anyone who has endured the bonds of big -- or little -- sisterhood, or longed for a life different from the one the world has dictated, and dreamed of trying something else on for size.